This is an excerpt from the novel The Arrows of Time by Greg Egan, first published in the United Kingdom by Orion/Gollancz in November 2013 and in the United States by Night Shade Books in August 2014. Copyright © Greg Egan, 2013. All rights reserved. From her hilltop post, Valeria swept the telescope’s field of view methodically across the barren plain. The grey rock showed few features in the starlight, but so long as she didn’t rush the task and left no gaps in her search, the kind of change she was looking for would be hard to miss. She knew she was done when she’d made a full circle around the scope’s mount, bringing her feet back to a patch of rough ground that she could recognise by texture alone. Done and ready to begin again. Two bells into her shift, Valeria could feel her concentration faltering, but whenever she was tempted to abandon the mind-numbing routine she thought of the incident outside Red Towers. The watcher there had seen a speck of light in the distance, small but growing steadily brighter. His team had reached the fire within a chime or two, and by drawing out its heat into three truckloads of calmstone sand they’d succeeded in extinguishing it. The Hurtler that struck must have been microscopic, the point of ignition shallow, the field of flame relatively small – and some scoffers had gone so far as to insist that there must have been similar strikes before, unobserved and untreated, that had come to nothing. But Valeria was sure that between the spot fires that would fizzle out on their own and the kind of unstoppable conflagration that would simply vaporise everyone in sight, there was room for the watchers to make a difference. If a planet-killer struck, it struck, but it wasn’t futile for people to try their best to fend off disaster for as long as possible. The clock beside her rang out the last bell before dawn. Valeria gave herself a break, rolling her neck and taking in the view untrammelled by the scope’s restrictions. At the foot of the hill the response team, her co among them, were napping in their sand trucks. Gemma had risen now, bright enough to hide most of the stars, but seven Hurtlers shone in the grey half-light: seven streaks of colour, scattered but parallel, each one displaying perfect mirror-symmetry across its dark centre. These ghostly spikes were lengthening slowly, their violet tips just perceptibly in motion, proof that they hadn’t even been near misses. If a planet-killer was on its way, there’d be no elegant pyrotechnic warning. But nor would the opposite fate come with portents: if a real solution to the Hurtlers was imminent, the moment of salvation would pass without distinction. If such a feat was possible at all then it was due to be achieved any day now, but there would be no signal from the travellers on the Peerless, no manifestation in the sky, no evidence of any kind. Still, Valeria took the Hurtlers themselves as proof that the travellers’ first goal was attainable: one object really could possess an infinite velocity relative to another. The history of each Hurtler was orthogonal to her own: the tiny rock’s eons of ancient darkness and its fiery passage through the thin gas between the planets all came and went for her in an instant, with nothing but the time lag for the light to reach her prolonging the spectacle. If the Peerless really had been accelerating steadily for the past year, its engines firing without mishap, its relationship to her would soon be the same as the Hurtlers’. Having entered that state, the travellers could maintain their course for as long as they needed, and whether the need was measured in generations or in eras, from her point of view they would live out their lives in the same blink of her eye, regardless. Valeria stepped away from the telescope and followed the lines of the Hurtlers to their notional vanishing point. Watching from Zeugma, she’d seen the blaze of flaming sunstone as the mountain sped away in exactly this direction. She held up her thumb, blotting out the point in the sky where the Peerless had been heading – blotting out a line that stretched away from her for an immeasurable distance. At the moment of orthogonality, that line would contain the entire history of the travellers from the day they shut off the engines to the day they had reason to return. In that instant, Yalda would struggle to give the whole endeavour the best foundations she could; in that instant, her time would come and she’d divide or die. In that instant, generations would follow her who had never seen the home world, and knew they never would. But they’d strive to gain the knowledge that their distant cousins needed, because they’d understand that it was the only way their own descendants could thrive. And in that instant, the journey, however long it had continued, would have to reach some kind of turning point. Hard-won triumph or abject failure, the same moment would encompass it all. Valeria kept her arm stretched out to the sky, humming softly as she mourned the woman who’d helped raise her. But Yalda would leave behind a powerful legacy. Among her successors in that cloistered mountain, free to spend their lives in unhurried rumination, someone would find a way to spare the world from the Hurtlers. Valeria was done with asking when. With nothing in the sky to prove her right or wrong, she was free to name the moment when the story of those generations finally unfurled, and the fate of the planet was settled in the blink of an eye, behind her thumb. Everything that happens, she decided, happens now. In the meeting room’s near-weightlessness the audience was spread out in three dimensions, and the hubbub evoked by her brother’s opening statement came at Agata from all directions. It sounded very much as if the people around her had taken Pio’s words to be more than a rhetorical flourish – and, alarmingly, she could hear a few chirps of approval mixed in with the murmurs of disquiet. This bleak conclusion relied on at least two false premises, but Agata restrained herself from offering a running commentary. Pio’s official opponent would soon have a chance to rebut him in front of the whole audience; all Agata could do was irritate her mother and a few hapless bystanders. The debate timer rang. Pio flipped the lever to silence and restart it, then moved back along the guide rope, allowing his opponent to take centre stage. “Who knows what our descendants will achieve?” Lila began. “I’m not going to try to refute Pio’s speculations. But it does seem clear to me that any attempt to migrate into orthogonal matter would be perilous – and beyond the danger to the actual pioneers aspiring to set foot on the Object, everyone on the Peerless would be hostage to the need to complete the process in a limited time. Over the generations, as their resources dwindled, they’d be forced to keep wondering whether they needed to cut their losses and try to head home after all. But the longer they put it off, the longer that return journey would be, and eventually any misjudgement of the time they had left would be fatal. Lila brought an image onto her chest; the room’s camera picked it up and displayed it on the giant screen behind her. “This is the plan,” she said. “This was always the plan, from the day Eusebio broached it with Yalda.” The sight was enough for Agata to feel a latent impression of the same familiar curve, ready to rise up on her own skin. This was the map of her life’s purpose; she’d understood that since the day she’d first seen it. The timer rang. Most of the crowd cheered; Agata ignored her mother’s look of lofty amusement and joined in. Lila deserved the encouragement. Pio’s ideas weren’t likely to get much traction, but with the vote less than a stint away they needed to be refuted decisively for the sake of everyone’s morale. Agata shifted uncomfortably on her rope. She knew he was being sarcastic, but any talk of weapons put her on edge. The audience fidgeted, underwhelmed. Everyone knew that the Peerless was a small target, and though it was true that the mountain’s defences would be useless once the Hurtlers crossed a certain threshold velocity, the period of vulnerability would be brief. Agata couldn’t contain an exasperated hum. The most dramatic effect she expected from the reversal was for the orthogonal stars to vanish from the sky. As Pio reached down to reset the timer there were a few scattered cheers. Agata turned to her mother and whispered, “The woman just won. It’s over!” Diehard migrationists might have their reasons to remain committed to the more difficult route, but whatever allure the idea held for wavering voters, Lila had just offered them a vastly less terrifying way to go on thinking about deserting the ancestors, without burning any bridges until their own safety was guaranteed. Cira made a non-committal noise. Agata clung to a rope outside the voting hall, watching the bars of the histogram slowly rising on the news screen beside the entrance. “I’ve got nothing else to do,” she said defensively. “Go and vote,” she suggested, shooing him towards the entrance. Medoro headed into the hall. Agata watched as the tally on the screen reached one third of the enrolled population. The “yes” count now outnumbered the “no” by more than a dozen to one. In principle the result remained undecided, but the truth was that her side was heading for an overwhelming victory. Agata took a swipe at him; he twisted away. She was almost certain that he was joking, but if he wasn’t she didn’t want to know. “Hardly.” Agata followed him down the corridor towards the food hall. “I’m not turning into a Shedder, either.” The idea of giving birth terrified her – whether or not she had to live through the process – but beyond her own fears the last thing she’d wish on any child was to be raised by her idiot brother. Greta turned to Ramiro. “Start the spin-down,” she said. Unaccountably, Ramiro hesitated. He’d been anxious for days that, at this very moment, some obscure detail that he’d failed to allow for would make itself known by undermining everything – but an unplanned hiatus wouldn’t so much forestall the risk of humiliation as turn his fears into a self-fulfilling prophecy. Just as Greta’s expression of controlled anticipation was on the verge of faltering – and revealing to every onlooker that the delay was not just unexpected but incomprehensible – his paralysis ended and he threw the switch. A single tiny coherer in the panel in front of him sent its light into the maze of photonics below, and the system that Ramiro had spent the last six years building, testing and refining began, very slowly, to move the mountain. Ramiro’s own unobtrusive display was feeding him news in real time; so far it was all encouraging. Not only were the engines reporting a flawless performance, the accelerometers and the star trackers showed that the Peerless really had begun shedding its spin. If all went well, in less than three days the mountain would be perfectly still. For the first time in six generations, chambers at the rim of the Peerless would be as weightless as those on the axis, and for a stint, the farmers and an army of helpers would work to reconfigure the fields, shifting soil from the useless centrifugal floors to surfaces once seen as walls. When they were done, the mountain would be slowly flipped, base over apex, ready for the main event. The catalogue of triumphs unfurling on the navigation screen finally reached the same conclusion as the real-time reports. “Congratulations!” Councillor Marina offered effusively. “We couldn’t have hoped for a smoother start.” Ramiro glanced towards her with his rear gaze, but she was addressing herself solely to Greta. Greta inclined her head graciously. “Of course,” Greta concurred, though Ramiro could see her struggling not to add a few words in favour of the present achievement. The mountain had gained its spin from giant slabs of sunstone spewing flame into the void, controlled by compressed air and clockwork. Now it was losing it through nothing but light – light flowing through the switches and sensors as much as the engines themselves. If that didn’t count as a real test, they should all just stay silent and humble until the home world itself had been shifted from its course. Ramiro thanked her and she closed the link. For all the built-in redundancy in his own system, an independent manual check was a welcome proof that the software was faithfully reporting reality. The Councillors filed out, with Greta following. Ramiro leant back in his harness and stretched his shoulders, chirping softly with relief. In principle, the program controlling the photonics could do everything now without further intervention: kill the spin, turn the mountain so the giant engines at the base were aimed in the right direction, then start those engines and keep them glowing with exactly the right power and frequency, until they’d fully reversed the travellers’ original velocity with respect to the home world. Ramiro could see himself sitting at his console watching the script playing out day by day. But if it was too much to hope that the Peerless really would drive itself for the next three years, he’d be satisfied if the program managed to detect and describe any problems it was unable to circumvent. He looked up; Tarquinia had reappeared on the navigation screen. “What’s happening?” he asked, surprised that she’d have anything more to report so soon. Ramiro’s anxiety deepened. The navigators used ultraviolet images of the region around the Object as a way of measuring the density of interstellar gas, traces of which could be seen being annihilated as it struck the orthogonal asteroid’s dust halo. “What are you suggesting? Some disappointed voters from Pio’s faction have decided that they’re going to get their way after all . . . at the Station?” Ramiro didn’t know whether he should be amused or horrified. The ambition was comical, but if there really were holdouts who’d concluded that the safest life they could make for their children lay in an abandoned research habitat, there’d be nothing funny when they starved to death. “Do you want me to chase down the Councillors?” Ramiro didn’t know whose job it had been to ensure that every last traveller was inside the Peerless before the spin-down commenced, but he was glad it fell entirely outside his own domain. “We could have done an automated census before starting up the engines?” Tarquinia suggested. Ramiro was roused by a discordant clanging of his own design, impossible to mistake for anything else. It was not a pleasant way to wake, but experience had shown him that no gentler sound could penetrate his sleep. He dragged himself out from beneath the tarpaulin of his sand bed and over to the communications link. The walls’ red moss-light had been gentle on his eyes, but when he switched on the display the sudden brightness was painful. “I’m going to need you to go outside,” Greta said. Ramiro massaged his skull, hoping to conjure up a third interpretation. “Why should we care?” Ramiro was mildly curious, but chasing a moving target across the void when no one’s life was at stake, and the environs in which the whole strange prank was playing out would soon be left far behind, struck him as a little disproportionate. “We think the intention might be to exploit the Object as some kind of weapon,” she confessed. Ramiro’s skin tingled strangely. He had never even been close to the Object, but since childhood he’d heard stories of Carla and Ivo’s near-fatal first approach, when even the faint wind leaking from their cooling bags had set the rock below them on fire. Ramiro doubted that anyone would have cared about a few upended trees if it had been clear that the whole mountain was at stake. But if the cost to agriculture seemed too great in the face of an undetermined threat, there were other routes to certainty. Ramiro stared at her for a moment, then he understood that there really was no squirming out of this. The one thing he couldn’t ask any pilot to bring back to the Peerless was a machine potentially booby-trapped with fragments of antimatter. Ramiro took her advice, fumbling at the harness with hands fitting loosely in the gloves of his cooling bag. While their gnat hung suspended from the outside of the Peerless the long flat couch against his back was vertical, like some kind of recuperative splint to help him stand upright. He’d flown in a gnat before, but this was a different design, with space for just the pilot and one passenger and a storage hold between the couches and the cooling system. The clearstone dome that stretched over their heads was close enough to touch. “Did they let you talk to your family?” he asked Tarquinia. Though he didn’t doubt her skills as a pilot, he suspected that one reason she’d been chosen for the job had been to limit the number of people who knew about the situation. “Good for you.” Ramiro had resented the pressure to keep quiet, but then welcomed the excuse to say nothing. He wouldn’t have known how to explain the task he was facing without alarming his family, and the last thing he needed right now was a lecture from his uncle about his duty to the children his sister was yet to shed. If everything went well he’d be back long before he was missed. He pointed to the navigation console. “Have you updated the local maps?” No one had been expecting to go flying once the spin-down had begun, and apart from the altered velocity of the slopes there was the small matter of steering clear of the beams from the counter-rotation engines. “No, I just thought I’d leave everything unchanged and see what happened,” Tarquinia replied sarcastically. “Ready,” she said. It wasn’t a question. She threw a switch on her panel and the gnat fell away from the mountain. Ramiro’s queasiness at the sudden loss of weight soon changed to elation. He’d forgotten how beautiful the outside could be; after six years of moss-light and display screens, the muted shades of starlit rock spreading out above him felt like liberation. As the mountain retreated, he looked down to the bright line of jumbled colours that divided the sky. To his right, the long trails of the home cluster’s stars reached their greatest luminance along this border, then vanished completely. To see any further would have meant seeing these stars’ futures – and they weren’t sending light backwards in time against their own thermodynamic arrows. To his left, the orthogonal cluster had the sky to itself, sprinkling its domain with small, neat colour trails. Ramiro was thrust abruptly back against the couch, ridding him of any notion that he was standing. He’d been expecting the change of vertical, but the pressure on his body was distinctly more uncomfortable than he remembered. After a few pauses wondering whether he was going to be able to hold down his last few meals, he managed to ossify parts of his torso, giving it better support against the unaccustomed weight so that it no longer threatened to squeeze out the contents of his digestive tract. As the gnat sped away from the mountain the sky’s stark asymmetry made it easy to maintain a sense of direction, but Ramiro still needed to check the navigation console to gauge their progress. When he finally looked back towards the Peerless again it was a pale grey triangle, a dwindling near-silhouette against the star trails. The engines labouring to end its spin produced no visible trace at all; even if the sparse dust rising out from the slopes was scattering the beams a little, they were far into the ultraviolet. 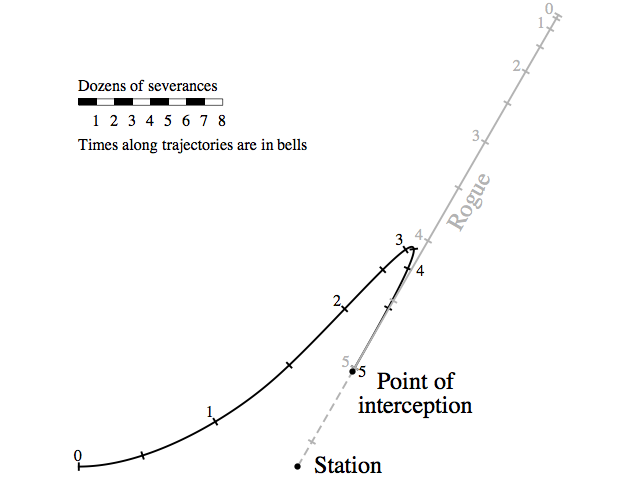 “It should take about three and a half bells to reach the Station,” Tarquinia predicted. Ramiro said, “Isn’t it usually six?” No wonder he felt so much heavier than on his last flight. “This gnat was designed for towing cargo,” Tarquinia explained. “I flew it myself, the last time they upgraded the Station. I was carrying a whole prefabricated living unit, but coming back, with no external load—” She brought six gloved fingertips together, then flung her hand forward as she spread them. Ramiro didn’t want to risk insulting her again, so he fought back the urge to ask her exactly how much cooling air they’d brought. Carla’s glorious optical rebounders required no fuel, with the gnat’s gain in kinetic energy coming solely from the creation of light, but the frequency-shifting mirrors that enabled that trick still generated waste heat. The more powerful the engines, the more air it took to carry heat away into the void. Tarquinia panned across the console’s map to show a featureless marker far from the Station itself. The rogue gnat had travelled a long way from its starting point – away from the Object too, with no apparent destination in sight – though in the latest observations it had been decelerating. With its engines now aimed in the opposite direction to their initial orientation there was no spillage from them reaching the Peerless; if the astronomers hadn’t known the gnat’s earlier trajectory they would never have been able to locate it. Ramiro would have enjoyed the challenge of instructing a second unoccupied gnat to seek out the first for a mutually destructive collision at the greatest possible velocity, but the gentler approach was going to be much trickier to achieve, and from his present perspective a great deal less enjoyable. “What were they thinking?” he asked wearily. Ramiro strained to hear her; the UV link to the Peerless was noisier than anything he’d experienced before. Ramiro felt sick. “You think they’ll try to destroy the engines, without warning?” Crashing a gnat into the base of the mountain – with either enough antimatter or enough sheer kinetic energy to do the job – would probably kill half the population in the process. Ramiro struggled to hear what followed, but eventually Greta’s theory became clear. She believed the rogue was doing nothing more than giving itself a run-up: travelling away from the Station in order to turn around and come back – with as much velocity as possible. Its target wasn’t the Peerless. It was the Station. 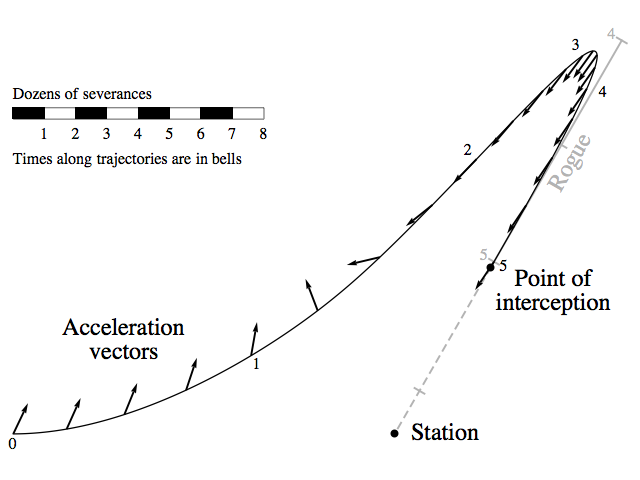 Given the angle of arrival, the collision would set the Station on a grazing trajectory towards the Object. When all those empty workshops and living quarters skidded across the surface of the asteroid, the explosion would send a plume of antimatter far out into the void – and the geometry of the impact would guarantee that the plume polluted a region that the Peerless needed to traverse if it was to commence the turnaround. The hazard would take a generation to disperse. If they tried to steer the mountain through the debris, the system that protected the slopes from the usual smattering of tiny specks of antimatter would be utterly overwhelmed – and the failures would not be embarrassing spot fires, they’d be blasts that tore cavernous holes in the mountainside and risked setting everything ablaze. “Can we move the Station?” Ramiro asked. The habitat’s own engines were weak things, intended to do no more than stabilise it in orbit around the Object, but if the rogue gnat could shift it with a few bells’ worth of accumulated power, surely their own benign craft could spend the same time gently towing it out of harm’s way? “Right.” Ramiro had been wondering why the rogue wasn’t simply dragging the Station to its demise, but apart from the question of which approach would be the easiest to automate, the least conspicuous and the hardest to prevent, the go-away-come-back-and-crash method would actually deliver a faster result. “You couldn’t have worked all this out before we left?” Ramiro complained. If the rogue came straight back towards the Station, there’d be nothing more to learn from its navigation system. They should have just tried to destroy it from the start. The console emitted Gretaesque noises, then the link cut out completely. Tarquinia turned to the navigation console, instructing it through the photonic corset that wrapped her torso beneath the cooling bag. When she’d finished, a flight plan appeared on the screen. Ramiro was slightly mollified. Three severances wasn’t much on the scale of this map, but it was more than six gross times the height of the Peerless. The shrapnel they were fleeing would never slow down, but it would grow ever sparser. “So is Greta right or not?” he asked. They’d lost the link with the Peerless, so they’d had no updates on the rogue’s actual behaviour. Tarquinia flicked a switch on the console; a moment later the link was restored. “What did you do?” Ramiro demanded. “Loud and clear,” Tarquinia replied. “Understood,” Tarquinia said cheerfully. She made no move Ramiro could see, but she must have sent a command through her corset because the flight plan on the screen changed from grey to red – transformed from a hypothetical doodle to a set of firm instructions. The sky through the dome rotated a quarter-turn as the gnat swung around to redirect the engines. “We’re really going to do this?” Ramiro asked numbly. He’d been half-hoping that the rogue would set out for the Peerless instead; forewarned, the mountain’s defenders could have launched any number of pilotless gnats against it, so the risk of it actually striking its target would have been vanishingly small. “What if we programmed a collision instead?” he suggested. “Then we can climb out here and wait to be rescued.” That would mean half a day in the void, but they had locator beacons on their cooling bags and they could take a couple of extra air tanks from the gnat. Greta didn’t reply; she knew better than to push him now. “So . . . we’re going ahead with the interception?” Tarquinia asked tactfully. Ramiro stared at the flight plan: the map of their future for the next five bells. As far as he knew, on every other occasion when two gnats had come together in the void they’d had cooperating pilots, and their main engines had been shut off for the approach. But here were the trajectories, meeting up perfectly right before his eyes. At Ramiro’s request, Tarquinia showed him a version of the flight plan with their acceleration marked. Translating between the standard maps and the starry emptiness around her might have been second nature to Tarquinia, but the only way Ramiro could hope to stay oriented was by knowing which direction would feel like “up” to him for the various stages along the route. They’d already acquired a substantial velocity towards the Station on their way from the Peerless, and now they were veering sideways, bringing them closer to the rogue’s trajectory. But in a bell and a quarter they’d begin to swing the engines around, until they were using all their power to reverse. Ramiro found it utterly perverse that they could have caught up with the rogue much sooner if it had been fleeing from them, rather than heading their way: the need to match velocities wouldn’t have forced them to waste time going backwards. “Do you have a tuneable coherer in your toolbox?” he asked Tarquinia. “I think we’ll need to burn the proximity sensors, before we get too close.” For long-range navigation the gnats relied on beacons, but to dock they picked up the reflections of their surroundings in infrared. The rogue had no hope of seeing them coming from afar, but once they tried to sidle up to it, it would know that it had company. “It could still shift sideways with the manoeuvring engines,” Ramiro suggested. “There’d be nothing to stop it recovering from that – and it would be enough to make our job impossible.” Once they were beside the rogue any sudden change in the main engines’ thrust would see it plummet out of sight, but it would only take the tiniest swerve to snap a boarding rope slung between the vehicles. She unplugged the photonic cable from her corset, then clambered down into the hold. As she rummaged around for the parts she needed, Ramiro contemplated her empty couch and unattended console. He’d happily imagined the Peerless driving itself for years – but in this fragile craft, rushing towards a near-collision, even the briefest absence of the pilot was enough to unsettle him. The bench was half the size of Ramiro’s torso, but it let them measure the angle between the scope’s axis and the coherer’s beam. By the time he had the crude weapon aligned, he looked out through the dome to see that the gnat had rotated again without him even noticing. The engines were dragging them backwards now, giving them a trajectory much like the parabola of a ball thrown under gravity – albeit in some very strange game where the skill lay more in controlling the direction of the ongoing force than in the initial toss. “Do you have children?” he asked Tarquinia. “He wished me a safe journey,” Tarquinia replied. The gnat reached the top of its parabola and started falling back towards the Station. Ramiro glanced up from the navigation console, unable to dismiss a stubborn intuition that the event ought to be visible somehow, but nothing in the view through the dome had changed. The Peerless was still tracking the rogue and sending updates; the thing was five dozen severances away, off to Ramiro’s left and “below” him – in the sense of “down” rammed into his body by the engines, the opposite of that in his tossed-ball analogy. He slid his head past the edge of the couch and examined the sky with his rear gaze, knowing full well that there was nothing he could hope to see. Even if he’d slipped on the ultraviolet goggles that Tarquinia had given him from her trove of gadgets, the rogue’s engines were pointed away from him. A similarly equipped passenger on the rogue might have seen the UV flare from the gnat ahead of them, but Ramiro was hoping that the saboteurs had had no chance to augment the vehicle with extra hardware. “We need to eat now,” Tarquinia declared, tugging at the lid on the store beside her couch. “I don’t have much appetite,” Ramiro protested. He took the loaf that she handed him and bit into it dutifully. It was a struggle to force the chewed food down his oesophagus; half the flesh that usually helped him to swallow had been ossified. “So the worst that can happen is that the saboteurs get what they want: a delay in the turnaround.” Worse was possible for the two of them, but Ramiro was trying to calm himself for the task ahead, not give himself a reason to back out completely. “I think a lot of travellers will be a great deal more displeased if the turnaround is actually postponed for a generation than they would have been by the mere effrontery of the attempt.” Tarquinia sounded bemused: hadn’t Ramiro invested a third of his life preparing for the event? Tarquinia fell silent. Ramiro felt a twinge of guilt: “grandiose posturing” might have been a bit too strong. “But?” Ramiro shifted uneasily in his cooling bag, hoping his meal was going to stay down. Half a chime before the expected encounter, Ramiro slipped on the ultraviolet goggles. It was impossible for the astronomers on the Peerless to measure the rogue’s position down to the last saunter, so Tarquinia had decided that the only reliable way to synchronise the next stage of the process was to allow the rogue to overtake them. The goggles didn’t leave Ramiro blind – the photonics aimed to overlay an image of any incident UV on an ordinary view – but the result was an imperfect compromise and he could understand why Tarquinia didn’t want to try to read the navigation console while wearing the things herself. “After this, every new gnat will have UV cameras built in,” he predicted. Ramiro adjusted the straps on his goggles. He wasn’t going to fret about some hypothetical escalation of the conflict. There was a problem right in front of them; they had to focus on it completely now. “Three lapses to go,” Tarquinia announced. Ramiro tensed, willing himself to vigilance. He turned slightly to the left. If the rogue arrived later than they’d anticipated, sticking rigidly to the flight plan would leave them perpetually ahead of it. Only by cutting their engines completely could they guarantee that the rogue would pass them, revealing itself through its flare. Ramiro fixed the pattern of the stars in his mind, noting each trail’s extension in artificial white beyond the usual violet. The rogue might pass them in the distance, and he did not want to be confused about the significance of some pale white streak. Ramiro said, “Nothing.” He was weightless now; the engines had cut off automatically. He strained his eyes, wondering if the trajectories could have been so misaligned that the rogue had already passed them by, completely out of sight. Something moved in the corner of his vision; before he could turn towards it there was a light in front of him, vanishing into the distance. “Now!” he shouted. Tarquinia restarted the engines, at a lower thrust intended to match the rogue’s acceleration. Magically, the white speck stopped fading. “It’s stable,” Ramiro marvelled. In all these cubic severances of void – and the further three dimensions of velocity in which they might have gone astray – they’d actually succeeded in crossing paths with their foe and keeping pace with it. Tarquinia raised the acceleration slightly; the speck grew brighter and slid off-centre. “It’s going left,” Ramiro warned her. Tarquinia eased the thrust down, turned the gnat fractionally for a few pauses, then turned it back again. As far as Ramiro could tell the rogue was dead ahead now. By trial and error they whittled away the distance between the two gnats. Tarquinia advanced cautiously; if they overshot the rogue its engines would become invisible. Instead, the light grew gratifyingly intense, to the point where Ramiro had to lower the gain on the goggles. Ramiro took off the goggles and waited for his eyes to adjust. Ahead of them and slightly to the left, the rogue gnat’s dome glistened in the starlight above its grey hardstone shell. In visible light, the blazing beacon he’d been following was reduced to a black patch at the rear of the hull. Tarquinia brought them closer. “I’m going to depressurise,” she said. As the air hissed out of the cabin Ramiro opened the valve on the tank attached to his cooling bag. Tarquinia put on her helmet, but Ramiro deferred; it would be awkward trying to aim the coherer with his face covered, and with the heat being drawn off most of his body he’d be comfortable for a while yet. When the rogue was suspended a couple of saunters away, he unstrapped his harness, found the release handle under the dome on his left and pulled open the exit hatch. He slithered around on the couch until he was facing out. Tarquinia handed him the coherer. He held the scope to his eye; there was nothing between him and the rogue but void now. He searched the hull for the two dark circles of the proximity sensors; he knew more or less where they had to be, but it still took three sweeps to find them. Ramiro reached up and set the coherer to blue – far enough from infrared that it wouldn’t trigger the sensors – and checked that the spot was falling on his first target. Then he slid the tuner further along, to a point he’d marked earlier with a speck of adhesive resin: an ultraviolet frequency that would permanently damage the lattice structure of the photodetector. The dark circle showed no visible change, but he’d expected none. He’d just have to trust the physics. He shifted his attention to the second sensor. When he was done, Ramiro righted himself on the couch. The navigation console was predicting an impact with the Station in less than four chimes. “Don’t worry about it.” On balance, Ramiro was relieved; the whole idea had sounded like a dangerous gamble. The rogue was drawing closer now; Tarquinia was using the manoeuvring engines to ease the gnat sideways. Ramiro waited for the rogue to turn skittish, but their presence had no effect on it at all. Either he really had killed the proximity sensors, or the saboteurs hadn’t even tried to make use of them. Ramiro slid into a safety harness attached to a short rope. Tarquinia had brought the two gnats to within about three stretches of each other; Ramiro could see right through the rogue’s dome now, into its empty cabin. If he’d been weightless he would happily have attempted to jump straight for the rogue’s hull, but under this much acceleration he doubted that he would have made it a quarter of the way. He poked his legs out through the hatch and reached around with his right foot for the panel that covered the boarding rope. He slid it aside and groped for the hook on the end of the rope. He’d chosen a cooling bag that left his feet uncovered, allowing him to re-form them easily into hands. He took hold of the hook, released the brake on the reel, then unwound what he judged to be a little more rope than he’d need. Seated on the rim of the hatch with his legs dangling down into the void, leaning a little so he could watch himself through the dome, Ramiro tossed the hook. When it struck the other gnat’s dome he cringed, expecting the worst; if the rogue’s software was monitoring sound in the cabin, this would be the time for it to scupper the attempted boarding. The rogue stayed put. Ramiro was puzzled, but he was beginning to suspect that the saboteurs had baulked at the idea of trying to automate a response to every contingency. Their overriding aim would have been to keep the rogue on course and on schedule; with the Station deserted and the Peerless so far away they had hardly been guaranteed visitors, and any extra layers of complexity in the software aimed at dealing with that possibility would have carried some risk of jumping at shadows. It was just bad luck for them that their plan had been detected so early; if he and Tarquinia had left the Peerless half a bell later, this whole encounter would have been impossible. Ramiro gathered up the rope and tried again. On his fourth attempt, the hook passed through the ring beside the rogue’s hatch. The boarding rope hung down into the void; he didn’t want to tighten it so much that any jitter in the engines would snap it, but as it was the catenary looked dauntingly steep. He wound some rope back onto the reel, until the dip at the centre was no more than a couple of strides. “How long have we got?” he asked Tarquinia. Ramiro removed his safety harness. The rope that tied it to the cabin’s interior was too short for the crossing, but if he’d substituted a longer rope that would have put him in danger of swinging down into the gnat’s ultraviolet exhaust. Having had no training in using a jetpack, he’d decided that the bulky device would just be a dangerous encumbrance. If he lost his grip, or if the boarding rope snapped or came loose, the safest outcome would be for him to plummet straight down away from both vehicles and await rescue. “I intend to.” Ramiro clambered out of the hatch and took hold of the boarding rope, swinging his legs up to share the load. He was more used to dealing with ropes in low gravity – as antidotes to drift rather than weight-bearing structures – but with four limbs in play he had no trouble supporting himself. With his rear eyes he gazed down at the stars beneath him; if he was going to react badly to the infinite drop it would be better to do it now than when he was halfway across. But though the sight was discomfiting, he didn’t panic or seize up. A long fall could only harm him if there was something below on which to dash open his skull. Nothing made for a softer landing than the absence of any land at all. As he dragged himself out along the rope, Ramiro’s confidence increased. He wasn’t going to lose his grip for no reason, and the two gnats remained in perfect lockstep, their engines running as smoothly as he could have wished. His thoughts turned from the mechanics of the approach to the task ahead. With only three chimes remaining, it had passed the point where all he’d have to do to spare the Station was shut off the rogue’s engines. Its sheer momentum now would be enough to carry it to the impact point with only a few pauses’ delay – not long enough for the Station’s orbit to move it out of harm’s way. But the saboteurs might have made it difficult to change the flight plan quickly, so his best bet would be to plug his corset directly into the engine controller. That was not a smart way to try to fly a gnat to a specific destination, but all he had to do was swerve sharply enough to avoid both the Station and the Object. Once he was clear of both, he could kill the engines and Tarquinia would come and find him. Ramiro felt the rope tilting disconcertingly as he approached the rogue feet first. He’d been looking up into the star trails, but now he raised his head; the hatch was just a few strides away. Clambering upside down into the cabin was going to be awkward, but he didn’t think it was worth trying to turn his body around. When the hatch came within reach, he took his right foot from the rope and stretched it towards the handle. His leg jerked back before he was aware of the reason, then the pain arrived, driving everything else from his mind. He was seared flesh and a bellowing tympanum, skewered to an endless, unbearable present, begging for relief that never came. “Ramiro?” Tarquinia repeated his name half a dozen times before he could form a reply. “There isn’t time,” Tarquinia said flatly. “No.” It would take at least a chime just to set up the hoses, let alone for the air to have any effect. Ramiro braced himself and began. Even with his injured foot touching nothing, his body complained about the effort and the motion; it wanted to curl up where it was. He tried bribing it with images of the safety of the cabin: the rogue was fatal, and the rope was precarious, but once he was in the cabin he could rest. Halfway back, Ramiro felt his foot growing mercifully numb. He looked down to see a swarm of tiny yellow globules spilling from the ruined flesh, glowing like the sparks from an old-fashioned lamp as they fell into the void. “You can’t drop, Ramiro.” Tarquinia presented the verdict as if she’d brook no contradiction. Ramiro felt himself scowling in disbelief; his pain-addled brain was proffering an image of him tumbling away into the safety of the void. With no rock beneath him, what was there to fear? But if he insisted on taking the gnats’ frame of reference and its fictitious gravity seriously, to complete the description he’d need to include the two things above him: the Station and the Object, falling straight down. Letting himself fall, too, wouldn’t protect him: those giant battering rams had already gained too much velocity. Turning his air tank into an improvised jet to push himself sideways might just get him clear of the Station in time, but the Object was too large, his aim too unreliable. He adjusted his grip on the rope, taking the opportunity to rest one arm for a lapse. He didn’t think it would be wise to try to mess with the cooling bag to let him extrude a fresh pair of limbs, but if fatigue really did start to threaten his hold he could try tying his corset’s photonic cable in a loop around the rope. As the gnats drew closer together, the centre of the rope dropped lower, nearer to the engines. Ramiro began climbing towards Tarquinia’s side, alarmed at how much harder it was to make progress with the rope at a steeper angle. Tarquinia poked her head out through the hatch, then reached down and began winding the rope in; Ramiro could see her straining to shift his weight, but she was doing much more than sparing him the effort of the climb. With the rope shortened the angle improved, and Tarquinia kept winding until it was nearly horizontal again. Then she disappeared back into the cabin, and the gnats moved closer still. Ramiro clung on, trying to ignore the revived throbbing of his foot. Everyone had imagined the rogue defending itself with antimatter, or elaborate software to deal with would-be intruders. But the measure that had actually defeated him might not even have been a deliberate strategy: in those last days at the Station, whoever had reprogrammed the navigation system might simply never have had an opportunity to restock the decommissioned gnat with cooling air. At this very moment, they might be fretting over the possibility that their weapon had overheated to the point where every photonic lattice had cracked and the rebounders’ mirrors had split into shards. Tarquinia turned the gnat so that its flat belly faced the rogue’s. Ramiro scrambled to keep himself away from both the engines below and the approaching slab of hot rock. As Tarquinia eased the gnats’ bases together he found himself suspended half a dozen strides below the hatch through which he’d left the cabin. With the side of his body resting against the polished grey stone of the hull, he could feel the surface growing warmer as heat spread into it from the rogue. But before he could panic, he registered a quickening flow of air from the cooling channels. Tarquinia’s gnat was built to run at three times its current power; the extra burden would not overwhelm it. “How long to the impact?” Ramiro asked. Ramiro hugged the rope. The immediate effect of Tarquinia’s shoving was imperceptible, but it wouldn’t take long before the rogue sensed itself drifting off course – and no tampering by the saboteurs was needed to ensure a response. The navigation system would adjust the power in the individual rebounders, skewing the direction of the main engines’ thrust to try to compensate for the deviation. Above, still, there was nothing but stars. How hard could it be to miss a target too small to discern? Ramiro flinched suddenly, his teeth aching with a hideous vibration. It was over in an instant, but his skull kept ringing. One gnat must have suffered a brief drop in thrust, scraping hull against hull. He steadied himself and tightened his grip. He still had no real sense of motion; if he closed his eyes, he might have been clinging to the side of a wall back in the Peerless, somewhere out near the rim. But now that Tarquinia had gone beyond simply matching the rogue’s trajectory, there could be no more placid mimicry: the instruments that were detecting her provocations were not so perfect and standardised that their response could be predicted and allowed for in advance. The rogue wasn’t even trying to shake them off – with the proximity sensors dead, it thought it was moving untrammelled through the void, in battle with nothing but its own errors. Ramiro cried out in shock before he knew why: the hulls were moving apart. Tarquinia said, “I’ve got it, I’ve got it!” The gap began to shrink, then the surfaces made contact again with an ugly grinding sound. Ramiro was shivering. If the gnats separated and the rope snapped on the wrong side, he needed to be ready to release his hold to stop his body being slammed against the overheated hull. Better to end up dashed against the walls of the Station than be flayed by heat from head to toe. He looked down at his ruined foot. It had grown numb again, but the luminous discharge was unabated. In all the years since the launch, only three people had gone to light in the Peerless; Ramiro had never paid much attention to the accounts he’d read of the phenomenon, other than fixing in his mind the importance of fleeing if he ever saw a glowing liquid seeping from someone else’s wound. All he could do was wait for the manoeuvre to be finished so Tarquinia could bring him a knife. He looked to the zenith and finally spotted a tiny pale oval against the star trails. “How’s our course?” he asked. They’d pushed gently against the rogue – not gently enough to remain unopposed, but there had to be some small chance that the net result had ended up in their favour. Ramiro tried to accept the news calmly. “What more can you do? Give me a couple of lapses with a knife, then we can fly away.” He could still survive this: he just had to cut through the rope on the rogue’s side before starting work on his leg. The manoeuvring engines delivered a modest push that any trained pilot could use manually, for docking. Severing the main engines from the feedback loop of accelerometers and gyroscopes that aimed to keep their thrust perfectly symmetrical, and then imposing a deliberate asymmetry to try to push their neighbour off course, would escalate the speed and violence of the interaction between the gnats by an order of magnitude. Tarquinia had the stronger engines – but the gnats could easily smash each other into rubble without anyone winning. “We don’t have time!” Tarquinia repeated. In the silence, Ramiro glanced up at the Object. It still looked absurdly small, but in another few lapses he’d see how big a target it made. Tarquinia seemed paralysed with indecision; if he let himself drop now he could take his chances with his air tank, while hoping that she came to her senses and simply flew away from the rogue in time. Ramiro was confused. “Do what?” Settle the argument before they were dead? “How do we automate the push?” she asked impatiently. She’d accepted his plan. Ramiro described the commands for the navigation system, raising the glyphs on his own skin as he spoke, picturing them repeated on Tarquinia’s body under her own corset’s empowering gaze. As Tarquinia echoed the last command back to him, the opposing hulls began to screech and shudder. The shaking cost Ramiro’s good foot its grip on the rope; the other one fell back against the hull. He barely felt the knock, but when he looked down there was a swarm of brilliant yellow specks dropping away into the void, endlessly replenished from his disintegrating flesh. The balance of energies that tamed his body’s chemistry was coming to an end; the damaged tissue was making ever more light, wrecking all the finely honed systems that had held the process in check. His only chance to survive would be to part from it, but in this juddering chaos he doubted he could take a knife from Tarquinia’s hand, let alone use it. The rogue shifted suddenly, its hull scraping backwards like a boulder sliding down an incline. Ramiro watched the slack part of the rope stretching out below him and readied himself for the void – but then the motion stopped abruptly. He understood what was happening: as the rogue fought to stay true – with no extra power to spend on the task – it could only shift its balance by throttling some of its rebounders, decreasing its forward thrust. Tarquinia was doing her best to fall back alongside their neighbour – and at least his clumsy fix had spared her from having to micromanage the sideways shove at the same time – but the whole encounter was too complicated to be rendered truly stable, and their luck couldn’t last much longer. Ramiro placed his injured leg against the rope and managed to work a full turn around it. But the loop was too low, barely above his ankle. He brought his hands down a span to lower his body while kicking out with his leg, until the rope rode up to encircle his knee. He made a second loop, then a third. He looked up to see the Object looming ahead, its red and grey rock mottled with craters and crevices limned with shadows in the starlight. Then in the foreground, far smaller for an instant but growing in no time to obscure the whole asteroid, he saw the Station: a cluster of stone boxes, rooms and workshops pieced together in weightless anarchy, rushing forward greedily towards the duelling gnats. Instinctively, Ramiro released his hold on the rope, convinced for a moment that this would save him. He fell upside down, hanging by his knee, his face to the sky as a featureless shadow flickered across the stars and was gone. He braced himself for the second, greater threat: a cratered landscape of antimatter rushing past near enough to touch – or rising up to meet him in extinction. The vision of it hung in his mind’s eye, stark and terrible. But the thing itself failed to appear. Ramiro lacked the strength to right his body but he raised his head sufficiently to stare up at the zenith. There was nothing ahead of the gnats now but the long, gaudy star trails of the home cluster. The shadow he’d mistaken for the Station passing by had been the Object; the first missed target had come and gone too rapidly to be perceived at all. He was still chirping with elation at the near miss when he noticed the yellow sparks falling around him. His whole lower leg was radiant now, filled to bursting with light. “Pull away!” he begged Tarquinia. He saw her helmet poke out of the hatch. “Wait,” she said. She was gone for a moment but then she reappeared with the safety harness. “There isn’t time!” Ramiro protested. But he understood why she was taking the risk: if he ended up falling alongside his amputated leg, it could still kill him. Tarquinia dropped the harness. Ramiro reached out to accept it, but the rope wasn’t long enough; the harness hung suspended beside his bad knee. He tried to raise his torso, but the effort merely set him swaying. “Grab it with your other foot,” Tarquinia urged him. Ramiro tried, but some earlier knock against the hardstone must have damaged his foot, robbing it of its power to grip. He poked it between two of the harness’s straps, pushed his leg through and bent his knee. “Now!” he pleaded redundantly: the gnats were already separating. He could see starlight between the hulls. As Tarquinia retreated into the cabin Ramiro felt the rope tightening, until he lost all sensation in the constricted flesh. Viscid yellow fire sprayed from the stump of his foot. The glow became too painful to watch; he threw his arms up in front of his helmet. Suddenly all his weight shifted to his good knee, almost pulling him free from the harness. The light from above was gone; Ramiro lowered his rear gaze and saw his severed leg tumbling through the void, part of the snapped boarding rope beside it. As he watched, the flesh liquefied completely then swelled into a ball of flame, lifting the rogue’s form out of the darkness. A moment later he felt a faint gust of warmth penetrate his cooling bag, then a single sharp sting to his shoulder. He groped at the wound with a gloved hand; it was painful to touch, but any break in the skin was too small to discern. Maybe he’d been hit by a fragment of bone. When the fireball had faded Tarquinia shut off her engines. The rogue shot forward, passing the gnat, making no attempt to recover from its failure. But even if this was a ruse – and even if the rogue didn’t overheat and shatter from a lack of cooling air – it would need eleven bells just to slow and come back, and twice that to make a fresh stab at the original plan. That left time for half a dozen more gnats to come from the Peerless and start towing the Station away. Weightless, Ramiro reached up and took the safety harness in his hands. He clung to it for a while, too weak to go any further, then Tarquinia began drawing the rope back into the cabin. Extra: Read about the mathematics behind Ramiro and Tarquinia’s pursuit of the rogue gnat. Copyright © Greg Egan, 2013. All rights reserved.